We have worked with the local library to successfully provide an interesting, hands on, and fun robotics workshop for school children. Allowing children an insight into exciting STEM fields creates a new generation of STEM oriented workers. As a team, we feel incredibly blessed and encourage one another to bless others in return. Gracious Professionalism within the FIRST community influenced one of our members (Nick M.) to create a community service project that we are proud to support. 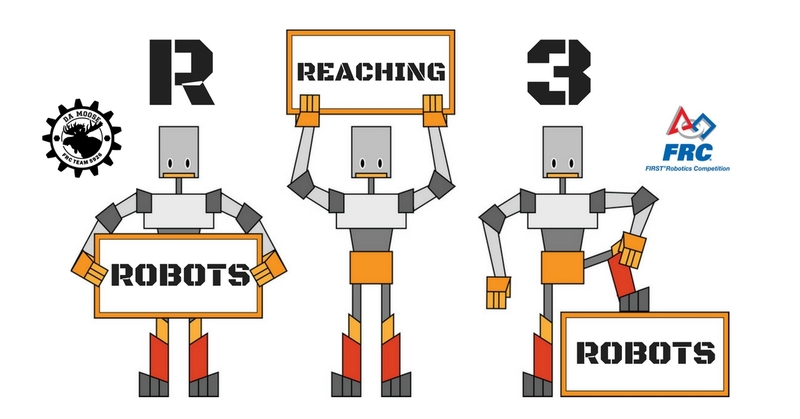 (See below for more information on R3: Robots Reaching Robots) We don’t limit ourselves to only STEM outreach activities either. We participate in community oriented events such as the Great Strides walk for Cystic Fibrosis. R3 is A community service project that exemplifies the FIRST ideal of “Gracious Professionalism” by identifying teams that are IN need of sponsorship. Contact is made with potential sponsors on behalf of the team in need. R3 has already successfully identified a team in need (Dynomite Robotics FRC Team 4380 of Detroit) and secured a number of sponsors for them. Additionally, Da MOOse has helped them with their “branding” by creating and donating buttons for them to share at FIRST Robotics events. If you are interested in finding out more about this successful outreach program, please contact us click here.